Business took me to Star Valley, Wyoming for a couple of days last week. It's only about a two hour drive from Driggs, and there are far worse places to spend time working. This sign on the south end of the valley is a warm welcome, and honors native Olympic Gold Medalist Rulon Gardner. He's one of the nicest guys you'll ever meet, as are most of the people there. It must be something in the water (more on that shortly). 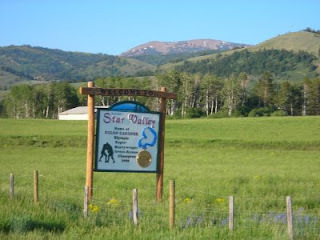 Star Valley sits snugly in the northwest corner of Wyoming, bisected by the Salt River (a blue-ribbon trout fishery), and punctuated by the towns of Afton, Thayne and Etna. I've been going there this time of year for ten years now, and last week was the most green and lush I've ever seen it. Hay fields were four feet tall, and nearly covered the wheel-line sprinkler systems. Old timers told me they're seeing flowers they haven't seen in twenty years. Maybe the good ole' days are returning. Weather was perfect, evenings were long, and of course I needed my after-work endorphin fix. 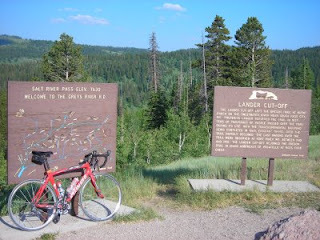 So, I pedaled my bike from Afton to the south, over Salt River Pass, down towards Cokeville, and back. The pavement was nearly new, traffic was minimal, and it was one of the most enjoyable road bike rides I've ever done. I actually hope to ride that section of road as part of the LoToJa bike race some day soon, so I got a nice photo at the top of Salt River Pass to remember it. Oh yeah, back to the Star Valley water. 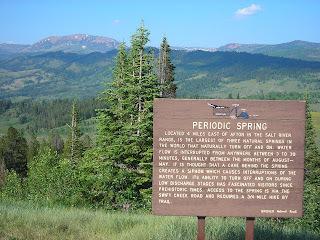 This sign explains the local Periodic Spring, near which water is bottled and sold throughout the world. Residents originally thought the entrepreneur was crazy, because who would ever pay money just for a bottle of water? Well, a few billion people in the world don't have water as fresh as Star Valley does, so needless to say the entrepreneur made out o.k. I can attest that it's the best tasting H2O you'll ever drink (Adam Sandler's "water boy" would be proud), and that's what I think makes all the locals so agreeable. 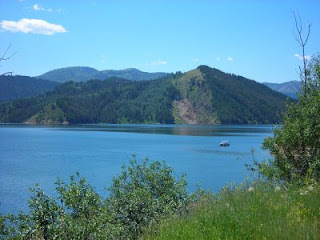 The drive back to Driggs winds along scenic Palisades Reservoir, a boating and recreation hot spot. Six weeks ago it was empty, and "experts" were predicting it would take 2-3 years of above average precipitation to fill it up again. Newsflash: it only took six weeks, and Jackson Lake (about 100 miles above it on the Snake River) is also full. I told you we had a wet spring around here! It's great to see the reservoirs full again, and hopefully they'll stay that way for a while now.